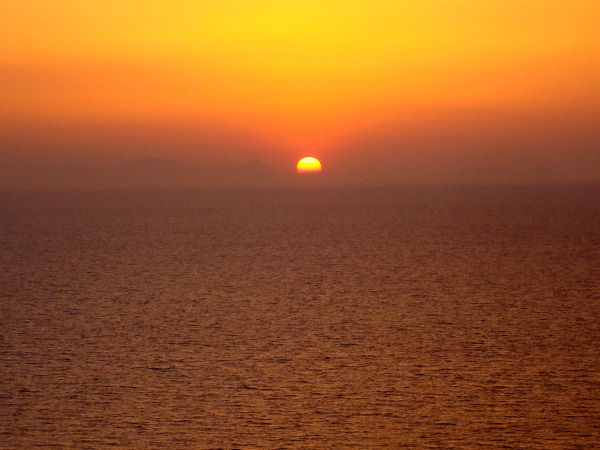 Sunset view from the island of Santorini, Greece, 2009. It's hailed as one of the most beautiful in the world. I've been a passionate advocate of Sabbath practice for a number of years now. I've studied it, lived it, and even spoken on the topic numerous times across both the U.S. and Canada. My definition is simple: intentional rest, mind, body, and spirit. It can involve anything from long walks to prayer and journaling and hot tea, anything that fills you back up after long seasons of pouring out. For me it's typically all of those things, plus insightful reading, deeply nourishing food, intimate conversations with my husband, hot baths and beautiful music. It picnics, flowers, both candle and sun light. It's time to regroup, set new boundaries, think creatively, and get alone with God. It happens like clockwork for this introvert. I go and go and love every last minute, and then I hit a wall. It's inevitable, precisely how I'm wired. And thus, I have to withdraw. You know how I know I've hit a wall?? When I have a meltdown and sob to my husband and eat a gazillion calories worth of Haagen Dazs. It's glaringly obvious. The last many days in Nashville were wonderful. They were full of friends and family, celebrations and coffee shops and country drives. They were filling in so many ways, but also exhausting. Josh and I also celebrated 11 years of marriage just this week, but our journey as a family unit is still new. In all the years to come, I want our children to be able to request a period of Sabbath at any point in time. If mom and dad become frazzled or distracted or stressed by the busyness of life, I want them to to be so comfortable and familiar with this concept that they never feel helpless or neglected. Although life will certainly have busy seasons, our family always, always comes first. I want them well equipped to get our attention if ever necessary. And because our home is in a constant rotation of hosting friends and family, something we love and consider ourselves made for, it's also time for a momentary pause. It's incredibly healthy every once in a while to draw the blinds. So. Beginning tomorrow we Sabbath. We accept limited invitations and we pause all hosting. We do not eat sugar, we exchange television for books, we sit and make eye contact when we talk, we pray together, we shut down the computer and turn our phones to vibrate, and we rest. Kind of like a spa day for our souls. These are decadent and chewy and delicious. All you need to whip them up are a few spare minutes and handful of ingredients. I stole a few minutes of precious nap time while my girl was snoozing and easily threw together two batches. They were so simple and inexpensive compared to store bought, not to mention you control the ingredients. Always a plus. All organic and gluten free ingredients per usual over here--and I couldn't be happier with them! The best thing about these are the endless variations. Use this as a base recipe (minus the chocolate chips) and add in anything you want: nut butter, dried fruit, coconut, seeds of any kind, nuts galore, coconut oil, you name it! I did a variation with big coconut flakes and almonds. Really yummy. Reminiscent of an Almond Joy. I want to try peanut or almond butter for sure, too, and one with dried cranberries and pecans, maybe sunflower seeds. Oh! The other thing? 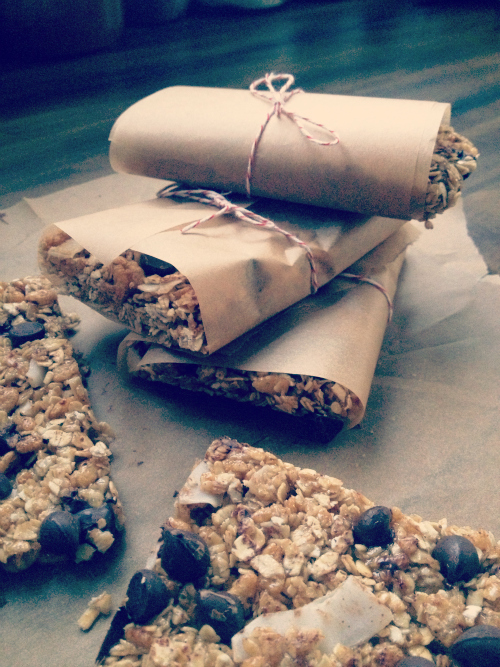 I hate those skinny little twiggy granola bars that offer you two bites and leave you wanting... I cut mine THICK! No skinny bars over here, people. And I still got a dozen per batch! That's two store bought boxes, four in my case. The cost comparison is insane. I don't have the exact math, but even with organic ingredients these cost a fraction of what their highly processed, store bought counterparts do. So there ya have it! Let me know what you think... and if you have any other flavor suggestions! Okay, nectar of the gods might be a bit much, but it IS at the tip top of my list of anything I put in and on my body. I constantly get loads of questions about how we use it, and it is no exaggeration when I tell you it's good for everything. 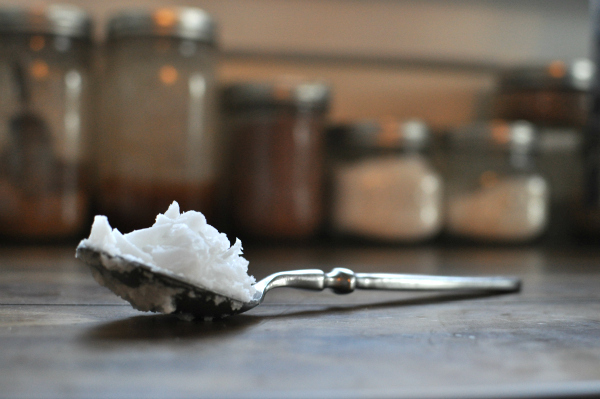 From makeup remover to cooking to insect repellent, coconut oil is magical. I feed it to Everyn constantly. Particularly the first couple of years, healthy fats are crucial for brain development in babies. You can mix it in food or drink, but mostly I feed it straight from the jar. She loves it. It was one of the very first foods I introduced. There's no chance of choking because it melts almost on contact, and it also aids in digestion, another excellent reason to feed it to babies, as their sensitive little digestive systems are still developing. for cooking. I use coconut oil as my primary cooking oil, occasionally switching it for olive when appropriate flavor-wise. It's high heat tolerance makes if perfect for frying and sautéing. I keep a huge jar directly by my stove, refilling it every week or two. for baking. Substitute it for butter (or cooking oil) in breads and cookies. You won't be disappointed. Coconut oil makes everything taste richer. So delish. Not to mention it's far healthier than butter and other oils. for seasoning cast iron skillets. We're huge fans of cast iron cookware for a whole host of reasons from affordability to durability to nostalgia. (my Moma has used it all my life) But nothing is worse than a skillet that sticks. Easy fix? Season it well with coconut oil. Again thanks to it's high heat capabilities, it's the perfect choice. greasing muffin tins and cookie sheets for baking. Starts a solid, melts into liquid as you rub, keeps everything from sticking! in coffee and hot tea. Because it's fantastic for killing off candida, supporting metabolic rate and thyroid function (hello weight loss! 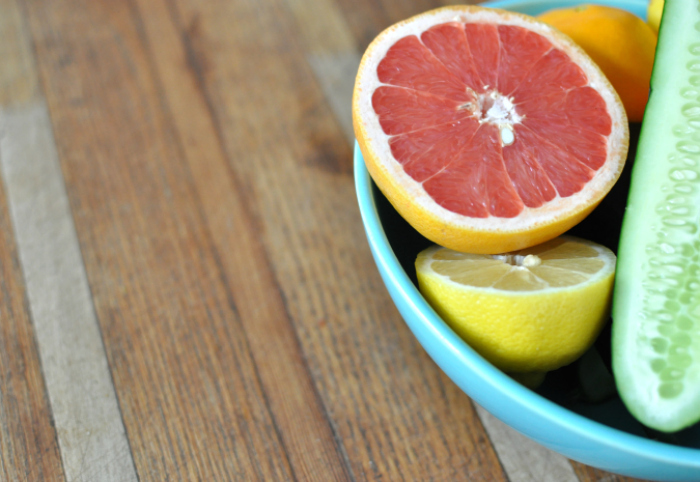 ), and gives a little boost of energy, I'm always looking for new ways to sneak it in. A teaspoon in hot tea is perfect. Not to mention it helps control cravings and greatly enriches the nursing mother's milk supply. face and body moisturizer. It's a great lip balm and aftershave, and I also use it in place of facial moisturizer on occasion. It takes a bit longer to soak in, but it's perfectly hydrating. I also use it from time to time as a hair conditioner. for rashes, cuts, and insect bites. Not only antibacterial and antifungal, it's also very soothing and speeds up the healing process. in smoothies. It's the perfect supplement for all the aforementioned reasons. for our dogs. It's just as wonderful for animals as humans. Feed it to them, rub it directly on their skin, etc. Those are are a few of our favorites! But I'm constantly coming up with new uses. Because it's been growing in popularity the last several years it's become available most everywhere. Of course I'm about quality above all else, so we purchase from an amazing company called Tropical Traditions. I buy their 5 gallon bucket of Gold Label when it runs half off, which it does frequently. I also try to order on the days they offer free shipping for additional savings. It will seem expensive at first glance, but once you compare quality and cost per ounce I find it hard to beat. Of course you don't have to buy quite that much. (Clearly we use a LOT!) Maybe start with a 32 oz jar. I'll be sharing some of our favorite fun recipes with you soon, too! Until then, check out the Tropical Traditions Recipe Blog. (scroll to the bottom for an exhaustive list by category) That should keep you busy for, oh, ever. What are some of your favorite uses? Anything I should try? I don't remember the last time a beverage made me so happy. I can't stop drinking these. One part tea, one part smoothie, one part heaven... oh man. They're divine. Being in the last few weeks of pregnancy has meant I don't have much of an appetite. Juice, fruit, tea... that's about the extent of what appeals at the moment. I've been doing lots of smoothies with greek yogurt to get some decent protein, but my 'normal' diet has sort of been shelved for the moment. At 37 weeks I've only gained 26 pounds, so listening to my body has certainly been the best route. That said, if tons of beverages are what's appealing at the moment, then tons of beverages it shall be! But this, oh my word, I'm not kidding. It's rockin' my world. It's so decadent it almost feels sinful. You really should freeze the chai into ice cubes first, but I haven't had the patience. Freezing will create more of a milkshake or smoothie-like consistency. Same goes for the banana. But I've simply been blending the above and pouring it directly over ice. (More like an iced coffee concotion.) And let me tell you, I'd take this over a frappuccino or milkshake any day of the week! It's. SO. Delicious.